Fragile X syndrome (FXS) is caused by a so-called “full mutation” in the fragile X mental retardation 1 (FMR1) gene at Xq27.3 and occurs in an estimated 1 of every 2500 to 5000 live births . It is the most common inherited cause of intellectual disability, and over 90% of males and 30–50% of females with the full mutation have IQ scores in this range (IQ < 70) . The cognitive phenotype of FXS is characterized by prominent deficits in executive function (EF), including problems with working memory (WM) [3–5], inhibitory control [4–7], cognitive flexibility/perseveration [6, 7], and selective and divided attention [7–9]. Most of these deficits have been documented in both controlled neuropsychological studies as well as brain functional magnetic resonance imaging (fMRI) studies showing abnormalities in frontal-striatal circuits . Torkel Klingberg and his colleagues at Karolinska Institute showed in a series of studies that WM capacity can be increased with intensive training [13–18]. Stemming from the success of their initial studies, these researchers developed a program that became the basis for the Cogmed computer-based WM training. The training program consists of several different computerized visuospatial memory training tasks, involving the temporary storage (and sometimes manipulation) of sequences in a game format appropriate for the individual’s developmental level. 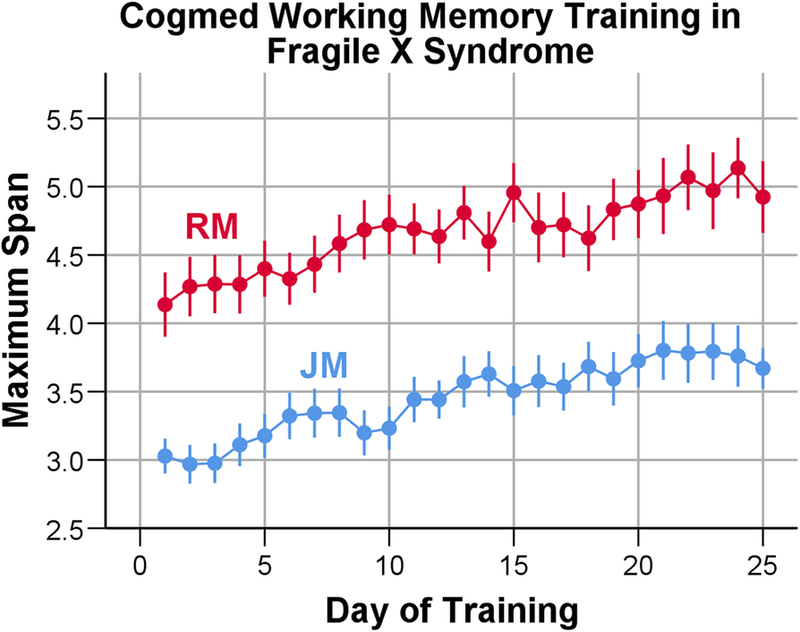 Training success depends in part on visual attention (to encode the sequence of animated figures) and response inhibition (to wait to respond until the sequence is complete), two aspects of executive function that are especially impaired by FXS. Cogmed is likely the most researched cognitive training program, with over 80 original, peer-reviewed research articles (Cogmed Claims and Evidence; https://www.cogmed.com/). Randomized, double-blind, placebo controlled studies documented that Cogmed and other WM training procedures may improve WM and academic achievement, reduce symptoms in children with ADHD, increase auditory attention and WM in preschool children, and improve inattention in daily life (see a review of published studies at https://www.cogmed.com/). 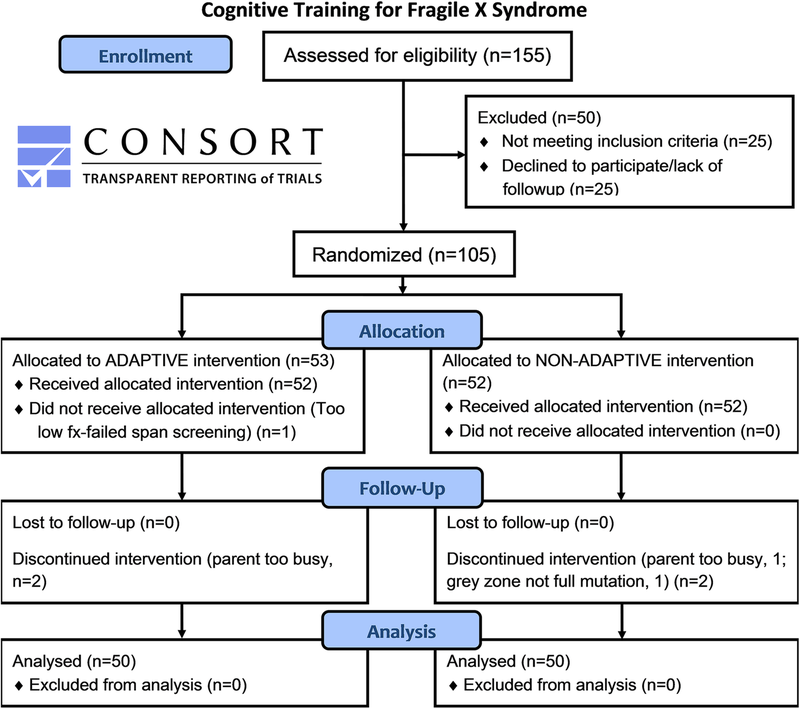 However, about the time that the current project was designed and initiated, the efficacy and generalizability of WM training came under considerable scrutiny, with some investigators concluding that “there is little evidence that these programs are suitable as methods of treatment for children with developmental cognitive disorders” and citing limitations of the research, such as the lack of methodological consistency between studies [19–21] and concerns about generalization beyond the training tasks (i.e., far-transfer effects) [20–22]. However, a subsequent "review of reviews" contradicts some of the conclusions . Part of contradictory findings may lie in the theoretical approach with Shipstead arguing that with cognitive training in working memory , one should expect to see improvement in general cognitive processes (c.f., [24, 25]). Shipstead et al. nicely detail recommendations for designing studies in order to evaluate the meaningfulness of cognitive training interventions. They include (1) use of multiple measures to assess the broad effect of training on functioning, (2) measure near-transfer effects with valid tools assessing working memory capacity, (3) use control groups that include contact with the experimenters, and (4) use raters blind to study condition for subjective measures. The current project attempted to address concerns raised by Shipstead et al. , although this project differs from many of those cited by Shipstead  in that our assumption was that working memory training would improve a narrow range of cognitive and behavioral processes associated with impairments in FXS, rather than broad cognitive functioning. We also make the assumption that there is greater plasticity in pediatric-aged participants than in the older adults cited in other commentaries critical of cognitive training .